Does your family have a favorite Thanksgiving Day casserole? Nearly every one does, and this is the dish that always makes an appearance at the Rowlands’ table. Combine eggs, flour, and sugar. Beat together. Add cheese and corn. Stir in 3/4 of the bacon. Turn mixture into ungreased baking dish. Sprinkle remaining bacon on top. 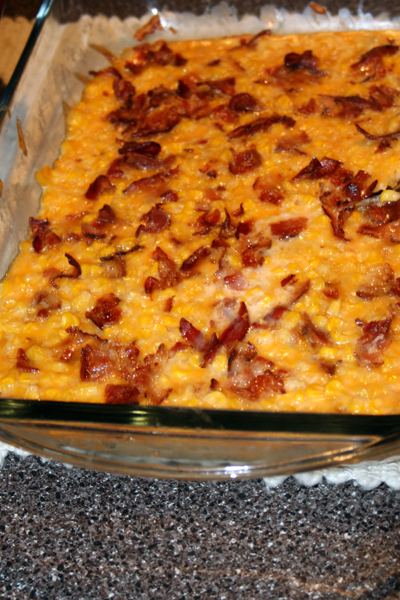 A constant holiday dish at my house for the past few years has been Paula Deen’s Corn Casserole (search for it on FoodNetwork.com). Super simple and delicious…just corn, sour cream, butter, and Jiffy corn muffin mix. The recipe also calls for grated cheddar on top, but one year I forgot it and we decided we liked it better without. Either way – a winner! We’ll have to try Paula Deen’s version — with cheese. Thanks, Suzy! Wussup Nick! Hi Emily! I tried making this last night. I made it thin mainly by accident because I used a bigger baking dish and added about a cup of cheese on top with the bacon. It turned out awesome! I absolutely loved it.